1. 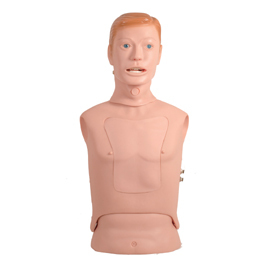 The model is upper body of male, which has correct sitting operation position. It is lifelike with high fidelity. Its skin tissue is soft and supple. 2. The model has normal nasal cavity and antrum maxillae structure, which is applicable for antrum maxillae puncture operation training. 3. It supports practice of antrum maxillae rinse operation. If it is correctly operated, liquid will flow out from nasal cavity. It is able to add simulated pus (Please prepare liquid detergent as alternative) to flow out from nasal cavity.